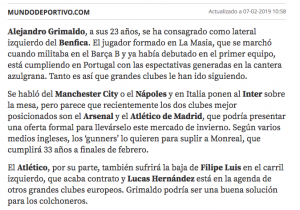 There’s a strange report from Mundo Deportivo on Thursday morning about Alejandro Grimaldo, Arsenal and Atletico Madrid. The Catalan newspaper set up a potential battle between the two clubs for the former Barcelona player, saying they want to strengthen their squads ahead of the next season. Grimaldo has this season put injury problems behind him and is a regular good performer for Benfica. Still just 23 years of age, he has plenty of potential and some good experience to go with it. Therefore, it makes sense that clubs such as Arsenal and Atletico would be keen, and Mundo Deportivo says they’re ‘best positioned’ to sign the player. Now here’s the parts which don’t make sense. It’s also claimed Atletico could make an offer ‘this winter market’, which we’d assume must be a mistake. Then it’s stated the English media have been reporting the Gunners want to get rid of Nacho Monreal. The stories surrounding the Basque defender recently have been more about Arsenal using their option to extend his contract by a further year. Putting the odd bits to one side, there’s likely to be the possibility of getting money for Monreal in the summer, with Athletic Club Bilbao eternally keen. Should Unai Emery be a fan of Grimaldo, then this is one to keep an eye on. The old Barcelona connection with Raul Sanllehi may also help.